Can You Speed Up Your Pokémon GO Progress With a Drone? Pokemon GO is a game that relies on its players going on long walks, meaning that some will eventually find any way to get around that system. Gizmodo spoke with Perdberd, who goes by the name Liam outside of Tumblr, and learned that his attempts weren’t all that that successful—largely because there weren’t any Pokemon in his backyard. Liam said that he used an app called AirDroid on his phone and laptop, which linked his phone screen to his computer (you can see it in the photo above). It allows you to access your phone over the internet, which meant that he could attach his phone to his drone using duct tape and interact with it over WiFi. “If I was on data, it would work much better,” Liam told Gizmodo. “The drone can go around 1,500 feet away from me and that is the estimated range of using Pokemon GO on a phone duct-taped to a drone.” Unfortunately, a non-WiFi connection would have been too choppy to throw a Pokeball. So Liam was restricted to the broadcast area of his WiFi and could only move the drone in a 50-foot radius around the router. He could theoretically catch more Pokemon and load up on pokeballs if he used this technique in a highly-populated area, but he lives in a suburb of Massachusetts, where the closest pokestop is a mile away. 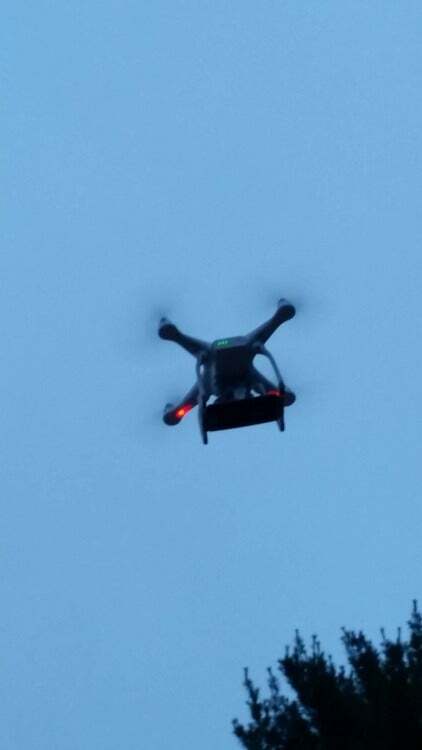 Flying a drone in public could potentially freak some people out. Plus, Liam said, the phone tends to mess with the drone’s compass and takes it off GPS mode. It’s a common problem with this brand of drone. Liam uses a Phantom 3 Standard, and according to the Phantom Pilots forums, others have run into similar issues when trying to use devices attached to drones. So you can take a breath. Perdbird is not a cheater after all. Yet under certain conditions, one could theoretically send their drone/phone combination off to catch ‘em all. You’ll just need a stronger signal and a drone that doesn’t fall out of GPS mode when duct taped to a smartphone.